I thought of this song when I decided to share this recipe with you. My friend Mandi in Texas is an “old friend” from 15+ years ago. We reconnected on Facebook and now we work together on our Plexus team. Last summer I drove to East Texas to help her launch her business and she served these yummy goodies. 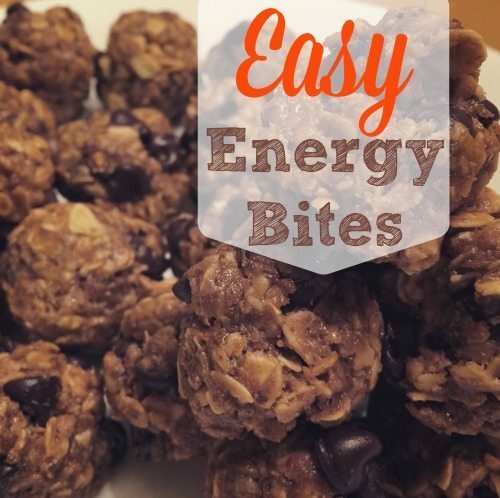 They’re called “Energy Bites” and I added the easy part because they’re, well….super-easy to make! Mix all ingredients in a bowl, then chill for 30 minutes. Roll into small balls, and enjoy! The toasted coconut and flax seed create a delicate crunch, while the honey and peanut butter add richness. And as we all know, anything with chocolate chips is worth a try. I’m excited to see my name in the newsletter!!! This is one of my favorite recipes, and everyone always loves them! SO GOOD! My coconut was still warm so it melted the chocolate chips. I pressed it into the pan and cut into squares instead of rolling into balls. Love them!! !